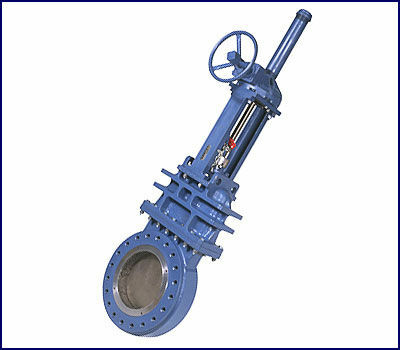 DeZURIK High Pressure Knife Gate valves are specifically designed to handle increased performance needs in the oil sands, steel, power, chemical and paper industries. The design features and options take into consideration the pressure classes and process conditions associated with worldwide demands of these industries, particularly for abrasive, corrosive and scaling services. DeZURIK’s High Pressure Knife Gate valves have been designed to significantly increase valve life, reducing replacement and maintenance costs. DeZURIK High Pressure Knife Gate valves are of carbon steel construction and have full body design structures for ANSI Class 150, 300 ratings and 550 CWP. Valves are cast for 3 – 48" (80 – 1200mm). Flanges are full-raised face per ANSI standards. Other specifications include high flow capacity full port, reverse flow capability and scraper packing rings. Pressure Rating: ANSI Class 150 (PN20), ANSI Class 300 (PN50) and 550 CWP (PN 40). Flanges: Flanges are full faced and comply with ANSI B16.5 for valves 24" (600mm) and smaller and ANSI B16.47 Series A for valves 26 – 48" (660 – 1200mm). The packing is a multi-layered system with isolated internal scraper, resilient live-load ring and exterior scraper/anti-extrusion ring. The packing box is bolted on for positive position and alignment with the gate. It is machined for close fit and better sealing. The packing box to body seal is an o-ring. The rod seal assembly consists of internal scraper, isolation washer, heavy duty rod seal and bearing. The housing to bonnet seal is an o-ring. Wall Thickness: Minimum wall thickness and allowable stress conforms to ANSI B16.34. Materials: Valves are cast in Carbon Steel, ASTM A216 WCB; Type 316 Stainless Steel, ASTM A351; and Duplex 2205 Stainless Steel ASTM A351 Grade CD-4MCU. Port IDs: ANSI Class 150 valves match standard pipe IDs. ANSI Class 300 and 550 CWP valves match extra-strong pipe IDs. Reduced port trim and v-notch are available. Lifting Lugs: Valves have lifting lugs/holes sized and located for safe hoisting of valve assembly. Jams: Gate jams are cast integral to body and are machined for positive gate alignment. Material: The gate material is carbon steel per ASTM A322, UNS 41400 hardened to Rc 43 minimum and Nedox coated .001 thick. Optional materials are 17-4 PH stainless steel per ASTM A564 hardened to Rc 43; 400 Series Stainless Steel hardened to Rc43; or Duplex 2205 Stainless Steel. Shapes: The gate edges are radiused through the packing area. Material: All pressure-retaining parts have certified chemical and physical test reports. Cast valves meet MSS SP55 standards, SP25 for marking and SP135 for design. Testing: Valves are tested per ANSI B16.34 and meet CL IV leakage for metal seats and bubble-tight for resilient seats. Manual actuator stems are single lead stub acme threads with one piece heavy duty clip welded on. The clip is set to transfer closing thrust loads directly to gate and not through bolts. Manual actuator stems are single load stub acme threads. The actuator bonnet stem connection is a threaded split block coupling that is bolted together Handwheels: Handwheels are sized for 80 lb. rim pull. Chainwheels: Chainwheels are sized for 100 lb. maximum rim pull. Hydraulic Cylinder: Hydraulic cylinders are sized for operation at 1500 psi (10,345 kPa) and are capable of 3000 psi (20,685 kPa) non-shock pressure. For valves with service above 550 psi (3795 kPa), an integral bonnet with a rod seal consisting of a pressure energized seal and a heavy duty braided scraper ring is required. Seal and scraper are replaceable without removing the bonnet or rod. Seat and wear ring are hard faced with Stellite® #6, chrome carbide or tungsten carbide weld on the ID and seating surface. An optional resilient seat in conjunction with the metal seat achieves bubbletight shutoff. The wear ring is set for minimum clearance from gate for full rated back pressure. The seat and wear ring are both replaceable. All valves are furnished with open and closed lockouts. The lockouts are full actuator rated and allow actuator removal while it is in the locked position. All valves are furnished with open and closed patented lockouts. The lockouts are full actuator rated and allow actuator removal while in the locked position. Purges: All valves have two purges in the valve chest or upper bonnet area. Bolting: All bolting is Grade 5 or better.